I decided to use a different wrapper this year (Holiday Blend) to switch up the flavor a bit; select Criollo98. Still the same core as last year's release. We will probably tweak the cigar a hair, so each year will be a little different than the last. For those that grabbed a 2010 enjoy and happy holidays. Thank you Andre for taking the time to answer my email. Enough chat, lets see how the 2010 smokes. I chose to buy My Viaje Holiday Blend 2010 in the petite robusto size because it's one of my favorite vitolas. (I picked these up at New Havana Cigars, but I am pretty sure he is sold out of them.) The combination of the small size, with the pretty large band, really made this cigar look tiny. I smoke a lot of petite robustos, but this one really looks "petite". I could tell when squeezing the cigar that is is fully packed and well-constructed. The foot of the stick is closed tightly, with the wrapper covering any sight of filler tobacco. The wrapper itself has a lot of tooth seeming to be in random places all over the leaf. A lot of times you see uniform tooth on wrapper leafs, but not with this stick. The pre-lit aroma was very leathery with earthy undertones. Not much of a cold draw on this stick (closed foot), but the wrapper left a earthy taste on my lips. I lit my Viaje Holiday Blend 2010 with some wooden matches because I didn't want to scorch the closed foot with my triple flame. The first few puffs were WOW, a fire cracker of warm spice and smoke exploding all over my taste buds. Just like I wrote in a past review of a Viaje cigar, this stick roared out of the gate and came to the show in full strength. Speaking of strength, right from the first puff I could tell that this was a full body cigar. You know those cigars that when you light them, you just know what you are in for? This is one of them. The volume of smoke was large and the draw was excellent. After about 3/4 of an inch in, the spice started to transition to the finish of the flavor profile and brought a strong cedar taste to the front. The cedar was not only prevalent in the taste, but also in the resting smoke between puffs. My smoking partner commented that it was a "sophisticated" aroma that reminded him of a high-quality walk in humidor. As you can see in the picture above, the construction was fantastic and the ash held very strongly for over half of the stick. 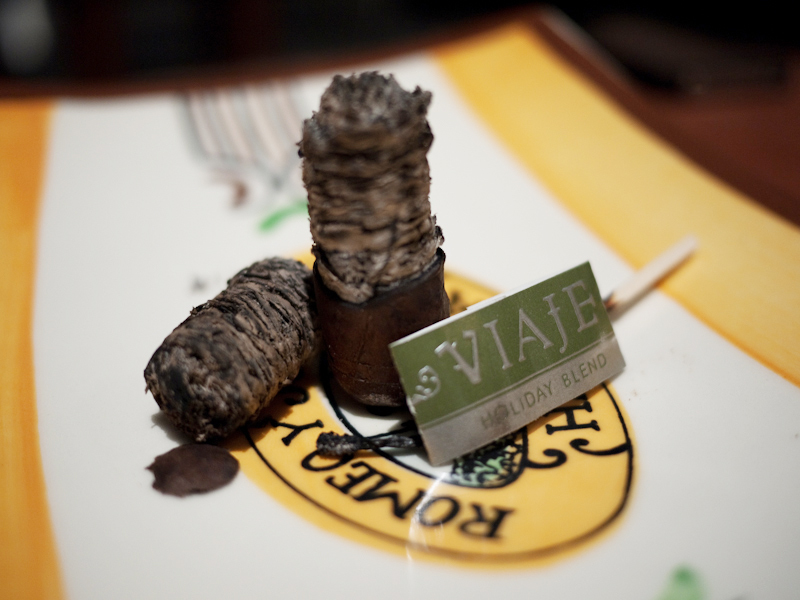 The second half of my Viaje Holiday Blend 2010 had some changes in flavors and more of a mellowing out of the smoke. When I write mellowing, I don't mean in strength (it was just as strong as it started)...I mean more in the flavors becoming one, and not as distinct to pick out. I was still getting a lot of cedar on the front of each draw, but on the finish, it was a mix of warm spice, hints of mild American-style coffee, and something else I couldn't put my finger on. Toward the nub, this mystery flavor got even stronger, but I still can't put a name to it. All these flavors blended nicely and made for a smooth and relaxing finish. The cigar burned perfectly all the way to the nub, never picking up any heat or harshness. I only ashed this cigar once before putting it down, so I'd say that is a testament to it's construction. Warning again...FULL BODY. My heart was well racing from the nicotine by the time I put this little guy down. It was not to much, but in a bigger size, it might be. 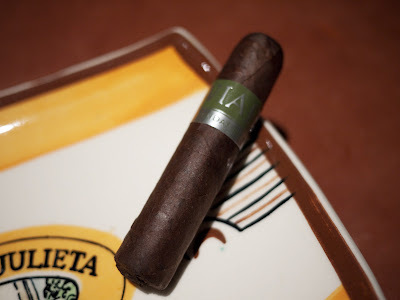 My final thoughts on the Viaje Holiday Blend 2010? Just like most other Viaje limited release sticks, this is not for the novice smoker. The power in this cigar is very evident from the first puff and, if you were not ready for it, I think it my throw you for a loop. 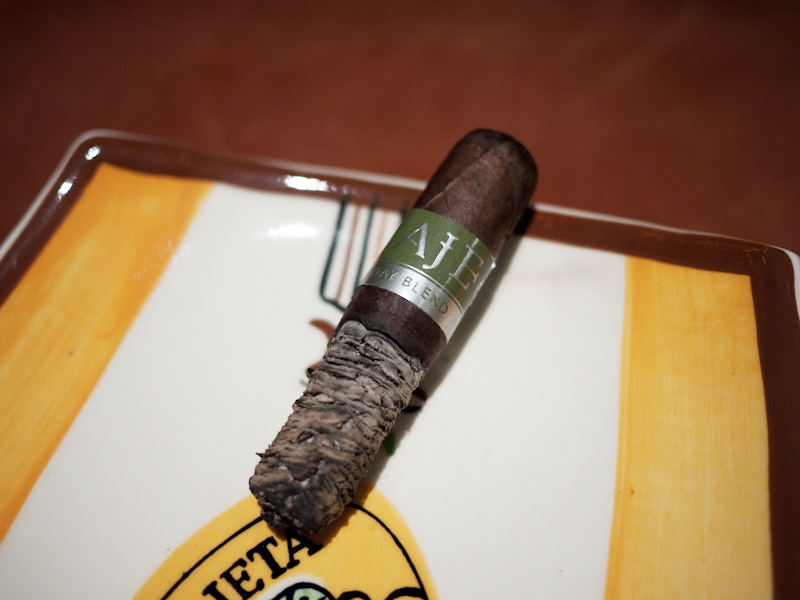 Once you look past the strength, the flavors were enjoyable, especially in the second half when the cigar mellowed a bit and became very full and rich in taste. I still am not sure what that mystery flavor is I was tasting towards the end, so I look forward to reading other reviews to see what my fellow smokers get out of this cigar. Awesome construction, perfect burn, enjoyable FULL BODY cigar. Would I buy it again? I still have a few of these left, so I don't think I would search for more at this moment. While I enjoyed the cigar, there are other rare/limited releases from Viaje with similar power that I enjoyed a bit more. Those would be the ones I hunted for before this one. Would I buy a box? I could not afford these in box quantities, but if I was a rich man it, would be fun to buy a box to sit on for years, simply because it's for the holidays. It would be great to pull out a full box 5-10 years from now in December and remember back to 2010.